New cholesterol guidelines are helping physicians and their patients take a more proactive — and personalized — approach to cardiovascular risks. “There is good cholesterol, called HDL, or high-density lipoprotein. HDL is ‘good’ because it travels through the bloodstream, picks up the bad cholesterol, and delivers it to the liver, where bad cholesterol is removed from the body,” explained Dr. William Cornwell, cardiologist at UCHealth University of Colorado Hospital on the Anschutz Medical Campus. How do I know what’s happening in my body? Not enough exercise and too many unhealthy foods make your body produce more LDL, or bad cholesterol. And though some people’s high cholesterol is a result of genetics, unhealthy behaviors are a significant contributors. A simple blood test called a lipoprotein profile can measure your cholesterol levels. Here is a chart that shows optimal lipid levels for adults, as recommended by the Centers for Disease Control. Why are the new guidelines important for me to understand? Although these are desirable levels, the new guidelines take a more individualized approach to cholesterol, according to Dr. Janice Huang, a general cardiologist with UCHealth Memorial Hospital in Colorado Springs. So, what are those risks? “We calculate risk using data such as history of hypertension (high blood pressure), age, total cholesterol, HDL cholesterol and smoking,” Huang said. She recommends that people visit the AHA 2013 risk calculator to understand their risk. The site helps those ages 40 to 75 who have their blood pressure numbers and lipid panel results determine their risk for cardiovascular issues. The new guidelines also acknowledge that patients with chronic kidney disease, women with early menopause or those with a history of pre-eclampsia also tend to be at higher risk. 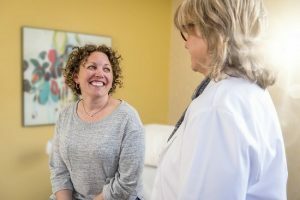 What should I be discussing with my doctor at my next visit? The new cholesterol guidelines emphasize shared decision-making between the patient and their doctor. Ask your doctor about your risks and your options. Photo by UCHealth. Is there a bigger push to use cholesterol drugs with these guidelines? According to UCHealth experts, there is not a bigger push for more patients to use cholesterol medications. Rather, the guidelines emphasize the need to identify the correct population of patients who would benefit most from cholesterol medications, and when the best time is for them to start taking the medication. This approach is expected to then minimize the exposure to risk to that lower-risk population. “If you put together both the cholesterol and exercise guidelines (see related story on exercise guideline changes), in summary, there is a bigger push for lifestyle changes early in life for primary prevention,” Cornwell said. What are the benefits and risks of cholesterol medications? Muscle aches or cramps are rare and are usually completely reversed with stopping the statin, Huang added. And though it depends on one’s individual insurance plan, these drugs are the most affordable, as they are the standard treatments for cholesterol, Cornwell said. PCSK9 inhibitors, a newer class of injectable cholesterol-lowering medications, have been shown to be very safe and tolerated well by the vast majority of patients, Green said. But they are also very costly: $15,000 to $20,000 per year. However, because of demand, Huang said the drug companies are cutting prices by as much as 60 percent. When combined with statins, these inhibitors have shown drastic reduction in LDL levels. Using a cholesterol-reducing drug may be effective in reducing risk, but it may take time, Cornwell said. Do age and lifestyle matter when it comes to cholesterol? Cholesterol levels are important at any age, and that’s why it’s recommended that children start to be tested between the age of 9 and 11, then again between 17 and 21. In northern Colorado, as part of UCHealth’s Healthy Hearts program, elementary-, middle- and high-school students can participate in the program’s cardiovascular health screenings. The program not only helps identify early heart issues but also empowers and educates students on the importance of heart health even at a young age. Does family history matter when it comes to cholesterol? Family history also is a big consideration when determining cardiovascular risks and evaluating cholesterol levels, Cornwell added. “Family history is more strongly recognized in the new guidelines as a risk factor that needs to be considered, particularly when a patient reports a family history of early heart attacks and strokes in multiple family members,” he said. Why are these guidelines changes happening now? These guidelines are an update on the 2013 guidelines, which were controversial, Huang said. The 2018 update helps practitioners be more specific in our recommendations and have addressed some gaps left in the 2013 guidelines.